Daniel Mattar is from Rio de Janeiro, Brazil, where he was introduced to capoeira in 1994. In 1999 he began to train intensively with Mestre Marrom. 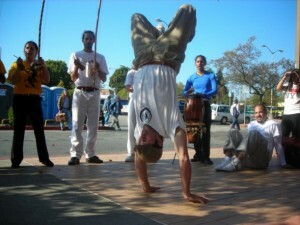 In 2002, Daniel moved to California and joined the International Capoeira Angola Foundation (ICAF). Together with Contra Mestre Rogerio, Daniel helped to build the two spaces for capoeira angola in West Oakland. In 2007 Daniel received the title of Treinel in Rio de Janeiro, during the annual ICAF conference. Daniel is the leader of the ICAF Oakland group under the guidance of Mestre Jurandir. Daniel has taught all ages of students, from kindergarten to college at UC Berkeley.